Moving to Ridgedale Park gives you great access to major shopping centers, a highly walkable area, family-friendly surroundings and enough distance from the heart of Atlanta that you will not feel overcrowded. 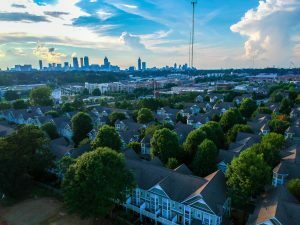 Located in the larger Buckhead area of North Atlanta, Ridgedale Park was first established in the 1920s, and today, encompasses a quiet community of fewer than 4,000 residents. In general, residents of the neighborhood are older than national averages. The average age of Ridgedale residents is 49, as compared to about 37, nationally. About 57 percent of residents rent homes and apartments, rather than own. Although the population is fairly low in number, the neighborhood, itself, is small, facilitating a close community among those who live in the area. The average cost of housing in Ridgedale Park is $307,323 for homes and $1,576 for rentals, both higher than the average U.S. neighborhood. If you are looking for English or French cottages, this may be the part of Atlanta for you. Along with a number of cottages among the 110 homes in Ridgedale, there are several other styles, including Tudor architectural styles, providing diverse single family housing types for new, incoming residents. Homes in the Park have a “personality” in how they are situated. Ridgedale Park was founded over somewhat hilly land, and many of the homes in the area have been built far back from roads, with large, rolling land for front yards. Shopping options include resident-favorites Barnes & Noble, Trader Joe’s and Kroger nearby. While there are no major shopping areas in the neighborhood, itself, you can walk to the combined 340 or so stores between Phipps Plaza and Lenox Square to the west, and the Cherokee Plaza to the east. Lenox Square is one of the premier shopping destinations in Atlanta. Inside the mall are Neiman Marcus and Macy’s department stores, along with several movie theaters. Phipps Plaza is near Lenox Square, and in fact, there is a free shuttle that runs between the two. Inside is a LEGOLAND. Discovery Center, a great spot to take children. Back over at Lenox Square, workshops are often held, as well as skincare wellness events, video game competitions and, at times, complimentary shopping assistance from fashion stylists. Public transportation and important roads can all be found near Ridgedale. MARTA has rail stations at Lenox to the west and Brookhaven to the north of the neighborhood, while the busy Peachtree Road also runs by. Ridgedale Park has an excellent layout for walkers and joggers, who enjoy its sloping streets. It has the added benefit of being within walking distance of the two major shopping areas while still maintaining its quiet, haven-like atmosphere where the residences are found. Ridgedale is also a very safe neighborhood with low crime rates, as it is perfectly balanced between being a non-violent suburban neighborhood and containing mid-cost homes that do not draw as many robberies. In nearly every category of crime, Ridgedale Park is below national averages. If you have children who attend public schools, they will likely attend Sarah Smith Elementary, Sutton Middle School and North Atlanta High School. In the late ‘90s, Smith Elementary was given the highest honor by the U.S. Department of Education for its high achievement scores, level of parent interest and effective curriculum. Sutton Middle is a highly diverse school with test scores above the state average. Students with disabilities also score much higher at this school, on average, than in the rest of Georgia. North Atlanta High School is run at the former Atlanta headquarters of IBM, and participates in the International Baccalaureate (IB) Diploma Program, which has helped the school produce some of the most college-ready students in the Atlanta metro area.